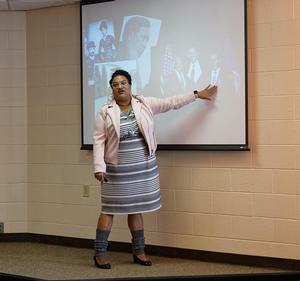 HAMPTON, Va. (April 8, 2019) – The Hampton University William R. Harvey Leadership Institute (WRHLI) held another Meet the Leaders Lecture Series, welcoming Hampton, Virginia’s very own, Delegate Marcia Price. “The William R. Harvey Leadership Institute was proud to welcome Delegate Price to the Meet the Leaders Lecture Series. She is one who is so passionate about her work and activism in the community. She embodies the type of leadership to help the Hampton Roads community prevail,” said Hampton University President, Dr. William R. Harvey. Raised on the Peninsula, Price is a Spelman College Alumna where she received her Bachelor of Arts degree in Philosophy, with intensive study in biology. She also received her Master of Arts in Religious Studies from Howard University. During her tenure of each program, Price learned as much as she could in order to return to the Hampton Roads community to make a positive difference. Price worked to start the Virginia Black Leadership Organizing Collaborative, a non-profit focused on “building empowered communities” through integrated voter engagement, civic involvement, and leadership development, where she currently serves as Director. “There isn’t just one definition of how to lead and there isn’t just one definition of what a leader looks like. You don’t have to do any of the things I’ve done and you can still be an amazing leader, but this is just what I bring to the table and what works for me,” said Delegate Price. To learn more about Delegate Marcia “Cia” Price, visit https://www.pricefordelegate.com/about_marcia.